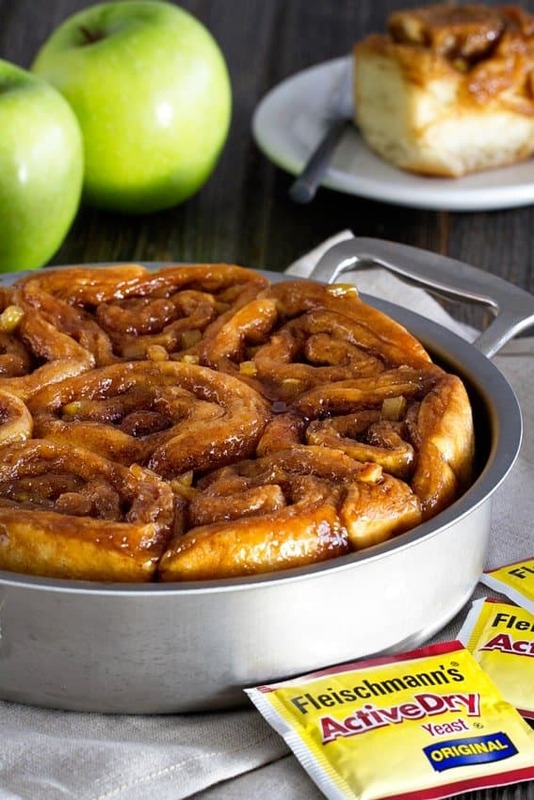 Caramel Apple Cinnamon Rolls are everything you love about crisp autumn nights at the carnival – in breakfast form. Imagine waking the whole family up to these gorgeous rolls! This is a sponsored post on behalf of Fleischmann’s® Yeast as a Bake a Little Extra Blog Ambassador. Thank you for continuing to support the brands that make My Baking Addiction possible. Fall, fall, fall! It’s finally fall, though weather in Ohio has seemed to skip straight from the heights of summer to snowy winter days. Seriously, it snowed here the other day. I can’t even with that, so I’m ignoring it entirely and focusing on my favorite fall flavors instead. 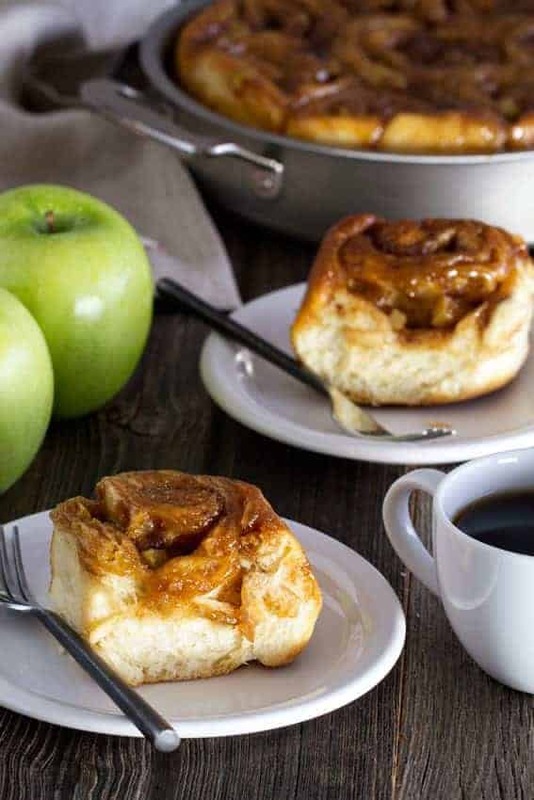 Like these Caramel Apple Cinnamon Rolls. Why it took me so long to put apples in homemade cinnamon rolls, I don’t know, but it was a complete revelation. I’ve made cinnamon rolls before – with yeast and without. I gotta tell ya – nothing beats the rise and flavor of a yeasted cinnamon roll. And it’s not hard to pull off this recipe at all. You can even make your dough ahead of time, and roll them up with apples and filling. The dough will rise, freeze, and bake perfectly from frozen thanks to Fleischmann’s® Active Dry Yeast. No guesswork here. And then covering them in caramel sauce? YES YES YES. Please don’t be intimidated about making your own caramel sauce. It’s super simple – especially because this recipe doesn’t even need a candy thermometer. This is one crazy decadent breakfast treat. And I don’t mind telling you that I ate TWO. In one sitting. I was having an eat-my-feelings kind of day, and these cinnamon rolls were 100% the ticket to a little bit of happiness. The flavors of cinnamon, brown sugar, butter and apples are completely irresistible, just like they’d be in apple pie. But these rolls are much more eat-with-your-hands friendly, and definitely toddler approved. Elle is a big BIG fan of Caramel Apple Cinnamon Rolls, if you couldn’t have guessed. She was especially excited because we used the apples she picked at the orchard to make them. She loved picking out the sweet, soft baked apple pieces and eating them first. You can do that too, or simply jump right in and devour them whole. Whatever you do, you’ve got to make them for a Sunday breakfast this fall. They’re just too perfect not to. You may even want to double the batch so you can stick one in the freezer, or gift one to someone you love a whole lot. These are definitely gifting cinnamon rolls. Disclosure: This is a sponsored post on behalf of Fleischmann’s® Yeast all thoughts and opinions are 100% my own. Thank you for continuing to support the brands that make My Baking Addiction possible. Combine 2 cups flour, sugar, salt and dry yeast in a large mixer bowl. Heat milk and butter until warm (100˚F to 110˚F). Add milk mixture and eggs; beat 2 minutes at medium speed of electric mixer, scraping bowl occasionally. Stir in the remaining flour, 1 cup at a time, to make a soft dough. Knead on lightly floured surface until smooth and elastic, about 5 minutes. Place in a greased bowl, turning to coat. Cover with a clean towel and let rise in a warm, draft-free place about 1 hour, or until doubled in size. Prepare the Filling: Mix brown sugar, sugar, flour and cinnamon in a small bowl. Using a pastry blender or two knives, cut butter into sugar mixture until the mixture resembles coarse crumbs. Set the aside until you are ready to sprinkle them on the filling. Prepare the Caramel Syrup: Place butter, brown sugar and corn syrup in a saucepan. Cook over medium heat, stirring constantly, until sugar dissolves. Pour caramel syrup into a lightly greased 13 x 9-inch baking pan AND either a 9 x 9-inch pan OR a 9-inch round cake pan. Punch down dough and divide in half. Roll out one portion of dough on a lightly floured surface to a rectangle about 15 x 10 inches. Sprinkle half of the Filling over dough; top with half of the chopped apples. Starting from the long side, roll up jelly-roll style. Pinch the edges to seal. Brush edges of dough with some milk if you have trouble getting the dough to seal. Using a very sharp knife, cut the dough into 9 pieces. Place pieces, cut-side down, on syrup in pans. 12 rolls will go in 13 x 9-inch pan and 6 in the 9-inch pan. Repeat with remaining dough. Cover and let rise 30 to 45 minutes, or until nearly doubled. While rolls are rising, preheat oven to 350˚F. Bake rolls 40 to 45 minutes, or until lightly browned. While they are still warm, invert onto a serving plate. Looks amazing! Can i substitute corn syrup, as it is not available in Europe? Oooo yummy, I adore these. 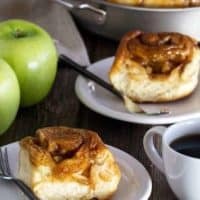 Apples in a cinnamon roll it’s a dream come true. They looks so comforting and I can imagine that your house smells divine after making these. So delicious!! These rolls look absolutely perfect! I love anything baked with apples! I can’t wait to try these for breakfast his weekend. Thanks! love these! going to try this recipe! These look amazing and I can’t wait to try them. I’m hoping to make some ahead of time for holiday breakfasts. Do you freeze them before or after you bake them? Do you have any suggestions for thawing/cooking/reheating? Thanks! Oh no! I am so sorry you had an issue with the recipe. Hopefully what remained in the pan was delicious! Thanks for stopping by! Ah I missed your freezing/baking instructions the first time through. Sorry! Hi, Courtney! No worries! I hope you enjoyed them! I have loved everything that I’ve made from MBA and these are next up on my list! Thanks for all of the amazing work you do with this blog. Do you think you could prepare them the day before and refrigerate them overnight before baking? Hi, Kristen! Thank you! I think these would work if you refrigerate them and bake the next day. Let me know how they turn out! This recipe looks delicious and I am thinking of making it this afternoon. One question though. Where do the other half of the apples come in? The directions say to “top with half of the chopped apples”, but I don’t see where the other half is used? Thanks! The dough is divided in half, so you’ll repeat the same process with the remaining dough, apples, etc. I hope this helps. Being an amateur baker without any problems training….I just tried out of nowhere. 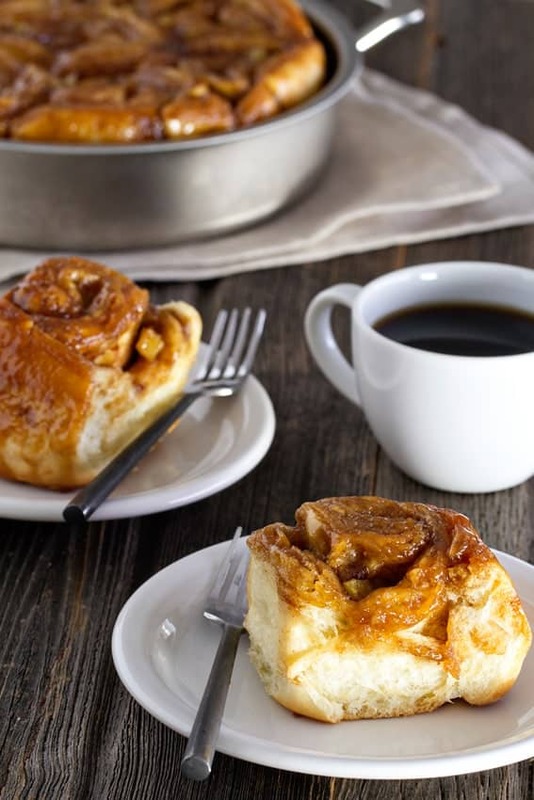 …these apple cinnamon rolls step by step as guided and my…..they came out awesome !! Everyone in my family cherished it so much and it was finished just in a moment. Thank you sooo much for the recipe, easy description and the photos. Am gonna follow this blog quite often now. Hi, Moumita! I’m so glad you and your family enjoyed these! Thank you for your kind words, too! Each packet is 1/4 ounce = approximately 2 1/4 teaspoons. I hope this helps! Thank you for your kind comments, Murielle! I’m so glad you liked them! At what point in the recipe could you freeze some for later? Cooking for just 2, I would like to save half. Hello! You can actually freeze them just about at any point. You can bake them completely and freeze them, or you could freeze them before baking. If you decide to do the second way, make sure you let them thaw and rise before baking. I hope you enjoy them!